Why the hell are Peace playing Made In Chelsea...? For anyone who hasn’t seen Made In Chelsea, it’s a bit like next-generation Cluedo. The cast are the inheritance-frittering sons and daughters of Colonel Mustard, Miss Scarlett, Professor Plum and Mrs Peacock, and in each episode someone has done something really wrong. Of course, it’s up to the other players to find out what. Eventually all the cards end up on the table, and someone finally guesses correctly what happened. Spencer and Louise, in the ballroom, with the candlestick etc, etc. Each week, the game starts afresh. It’s a show openly watched by thousands and secretly adored by millions. It operates as a fly-on-the-wall mockumentary, injecting into your eyes the pepper spray reality that not only do Britain’s richest 1% own as much wealth as 55% of the poorest, but they are also absolute twats. It’s the ‘I don’t agree with Boris, but isn’t he charismatic?’ argument, commodified and marketed as a hugely profitable entertainment series. The fact that advertisers now pay the cast to star in specially commissioned adverts during the breaks suggests horrifyingly that most viewers don’t just look and laugh at this social stratification circus anymore, they are aspiring towards it. Hoping to one day step through the looking glass, and go clay pigeon shooting with Proudlock. Content aside, the Made In Chelsea music team do a pretty good job of soundtracking episodes with a bigger wedge of new music than much else on television. 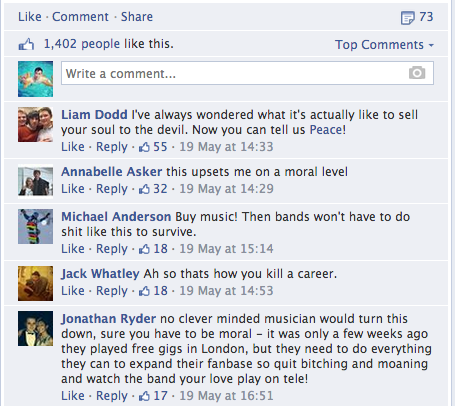 It’s just a shame our new bands have to associate themselves with such pish to get that attention. But for a band to play the show and immerse itself in this f*ckwit fantasia isn’t just a step too far – it’s four and a half miles. So, why exactly did Peace compromise their dignity? Did they do it on purpose? To create some sort of ultimate meta-satire by performing their capitalist takedown single to its very detractors while they unknowingly danced along? If so, it didn’t work. As the band rattled through a few of their hits on a tin-pan PA system in some sort of Country Living show home, they were largely ignored by the cast and sometimes the camera. The guy who organised the gig was just standing outside. The birthday girl, whose party the band was playing, didn’t turn up until halfway through, and then she made a beeline for her ex-boyfriend, so they could carry out a very loud conversation directly in front of Peace. The same guy then falls out with someone called Binky, and then another bit-part character about nothing of substance – all, of course, directly in front of the stage. Nevermind The Clash at Trinity College in 1977, this was real front row mayhem. Meanwhile, Peace continued to determinedly play through their catalogue, but to little avail. Finally, the ultimate sucker punch arrived, when most of the cast just walk out. They leave, no goodbyes, to begin conversations in a room somewhere away from all that bloody racket. It wasn’t all a waste of time for poor Peace though, because Made In Chelsea star Fran Newman-Young was in the crowd, and she ‘works in the music industry’. Peace tried to counter-attack any sort of real slagging for doing Made In Chelsea by putting out a statement on Facebook that was cleverly constructed using fatalist devices, and a traditional ‘us and them’ approach, to remove any sort of responsibility for their decision. “What if they didn't like earth music? What if our earth fans found it confusing? What if we let it slip about the outside world? In one of the universe’s more paradoxical outcomes, we play our single ‘Money’ live on Made In Chelsea tonight” read their short manifesto, thus blaming it all on a higher power, and using enough kooky words to suggest that though it might look bad, it’s actually just ‘random’. Judging from the thousand-plus likes, it was pretty effective. Unfortunately, the whole thing reminds me of when Dan Ashcroft goes to The Weekend On Sunday in Nathan Barley, fails to get the job, and tries to save face on his return. Despite the popular shouts of ‘sell out’, Facebook kind of provides the answer to the question I’m slowly tackling here. Why did Peace do it? Because, “no clever minded musician would turn this down,” says one Facebook fan. And he’s got a point. The options for bands to break television in the UK is astoundingly low, but, as shown by the way Lana Del Rey’s non-album track ‘Gods & Monsters’ re-entered the charts via 60 seconds on a one-week EastEnders commercial (below), the power of television hasn’t waned whatsoever. According to Ofcom’s 2013 statistics, 75% of adults have broadband internet access, and 44.3% of homes have DAB digital radio access. Compare that to 97% of homes with digital television. Any band aiming for the upper echelons of popularity must have the TV conversation at some point in their career. In America, it’s a much easier conversation to have. There, shows operate as willing springboards for new music, and often compete with each other to break acts. For a band touring in the States, there is the option to pitch for a slot on The Tonight Show Starring Jimmy Fallon, Saturday Night Live, Late Night With Seth Meyers, Late Show With David Letterman, Conan O’Brien, Jimmy Kimmel Live!, The Late Late Show with Craig Ferguson, Last Call With Carson Daly, The Arsenio Hall Show and several more. Only recently, a performance on Letterman transformed Future Islands from underappreciated indie-synth band into the internet’s new darlings. Who could forget Odd Future’s television debut on Jimmy Fallon? Furthermore, it’s apt that the first time I ever saw the British vocalist Charli XCX performing on a television screen was while I was in the States, when she appeared on Good Morning America alongside Iggy Azalea. Unfortunately in the UK, our talk shows operate under a soaking wet safety blanket of mediocrity, with their slots used mostly as opportunities to remind viewers who still exists. Consequently, Graham Norton’s recent music guests include Coldplay, Barry Manilow, Kaiser Chiefs, Paolo Nutini, Imelda May, Kylie Minogue, Ellie Goulding and Paloma Faith. Their most audacious championing of new music came in the shape of UK Eurovision entry Molly Smitten-Downes. And didn’t she do well? Alan Carr’s Chatty Man treads a similarly humdrum path with performances from Gary Barlow OBE, The Kooks, Enrique Iglesias and other such ‘00s music magnates. It even bizarrely doubles up by booking – guess who? – Minogue, Goulding and Faith. As for BBC Breakfast, unless you’re BBC Three’s Young Musician of the Year or an early 1990s pop saxophonist, you’ve haven’t got a chance. The world of British television reminds me of going to France with someone who can actually speak French. In reality, most of us can speak a little français, but when with someone who’s fluent, your natural instinct to bother trying just completely dissipates and you become a gibbering, needy idiot pointing at things on the menu like l’eau minerale and asking what it is. When it comes to even trying to break music, UK talk shows are idiots – because they think alternative music is what Jools Holland does, so it’s best they don’t get involved. Later… With Jools Holland is the fluent French friend ordering everyone’s pot-au-feu, except when it arrives it tastes like cardboard quiche. Later… is dying painfully from a lack of evolution or competition –what you see now, every week, is its death rattle. It is a boring show, with a regimented and stolid format that takes the beauty and impulsiveness of live music and compacts it into unrecognisable cubes of uniformity, like an industrial car crusher. Such is the suppressed atmosphere of forced enjoyment that the show comes across like the only ‘entertainment’ program to get past Big Brother’s censors in an Orwellian dystopia. It wouldn’t be a shock if the camera accidently panned too far left one time, and you saw two soldiers raising signs saying “cheer now”, “clap now”, “move on”. Can you imagine Odd Future performing their balaclava-clad, smoke-filled, stage-designed Jimmy Fallon television debut on Jools? Of course not. Not that they would even get a chance, as the show’s relationship with hip-hop is almost non-existent unless Yeezy comes knocking. Grime? Don’t make me laugh. It’s all far too nicely segmented for that: here’s your fourth album-promoting, white-male guitar band; here’s your world music; here’s your famous American; here’s your chart-straddler; here’s the one coveted new music slot; and here’s someone your dad likes, because they’ve got a book out. South London’s King Krule, for instance, is an artist the UK should be proud of. So, why can’t he get on screens until he goes to America? The reality is that the UK desperately needs a place for these new artists to play music on television. A show purely about new music just wouldn’t survive on terrestrial, so the responsibility lies – as in America – with the talk shows, breakfast slots and quiz programmes who should be encouraged to use their position for breaking bands and delivering even a slice of quality, live music to 97% of the nation. For Peace fans disillusioned by their performance on Made In Chelsea: it wasn’t pretty, but what else is there?